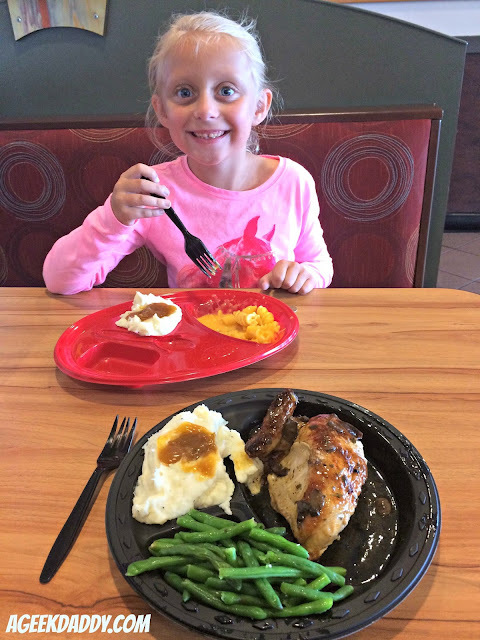 Boston Market is one of my favorite places to enjoy a daddy-daughter lunch eating out because I know it is a place where we can enjoy a delicious, wholesome meal together. 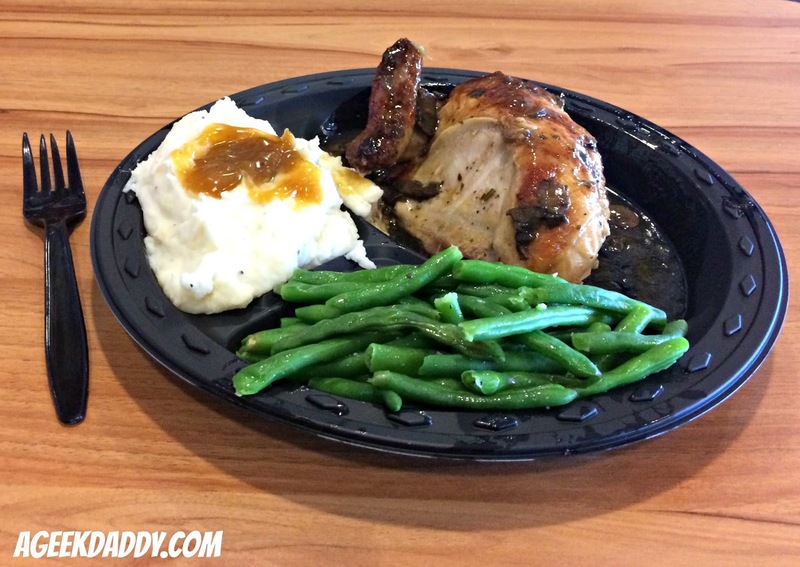 On our most recent outing, I tried the new Rotisserie Chicken Marsala which covers Boston Market's signature rotisserie chicken with a tasty sauce made up of sauteed cremini and portobello mushrooms, fresh herbs, garlic and a savory Marsala wine sauce. This is complimented by the restaurant's new Roasted Garlic and Chive Mashed Potatoes made with real potatoes, milk, butter, cracked black pepper, roasted garlic and chives which are whipped until soft and creamy. 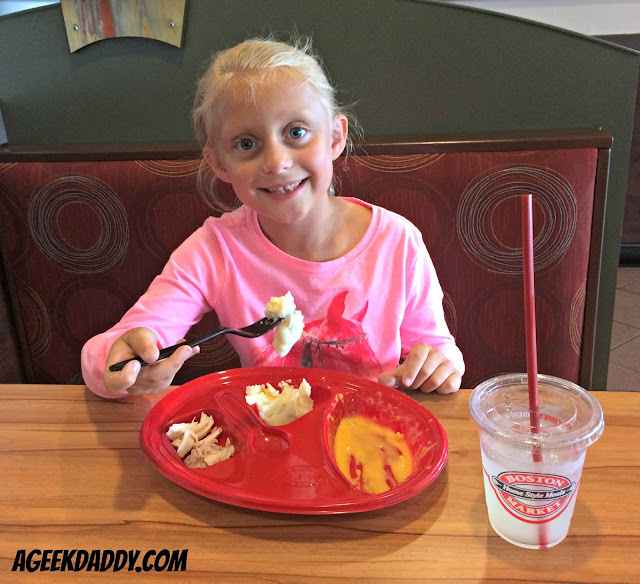 My little girl loves Boston Market's Mac & Cheese and Mashed Potatoes so she enjoyed a Kids Meal that combined the two along with a lemonade to drink. Plus she shared some of my chicken and I found that she kept asking for more and more and more. "This is really good" the seven year old remarked to me as she gobbled up a good portion of my meal. If my picky eater daughter likes it you know it really has to taste great! 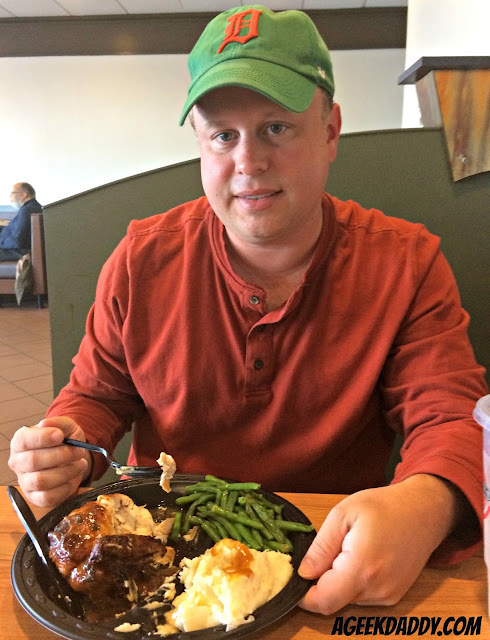 Boston Market's Chicken Marsala is something a bit out of the ordinary from someplace known for serving casual fare and you can eat it without feeling guilty as this healthy meal is a far cry from the junk food that so many people, including myself, have a bad habit of over indulging in. I agree with my daughter it was a "really good" meal with a nice touch of Italian cooking inspired flair. If this meal caught your attention don't wait to swing by a Boston Market because the Rotisserie Chicken Marsala is only available for a limited time. It's no trick that this treat will be gone by Halloween. Chicken Marsala will only be available on the menu through October 30, 2016. In addition to swinging by a Boston Market, the new Rotisserie Chicken Marsala is also available for purchase through online ordering and catering. It is available as Individual Meals in three selections, Half Chicken, Quarter White, or Three Piece Dark with each option coming with two sides and a cornbread. For more information or to find a Boston Market location near you, please visit BostonMarket.com. Make it #MarsalaTime the next time you are heading out to eat!